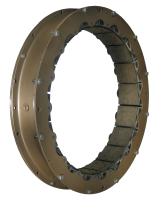 All Pneu&dash;Grip clutches are designed for minimum maintenance. The pneumatic air tube automatically adjusts for shoe wear. Plus, they operate as a single unit, with the only moving parts being the clutch and drum. 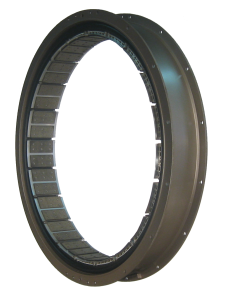 Designed to operate as a single unit, with the only moving parts being the clutch and drum, the Pneu&dash;Grip General Duty clutch requires little maintenance. The pneumatic rubber expansion tube automatically adjusts for normal shoe wear. The shoes are constructed with non-asbestosn materials. Smooth and even contact with the drum prevents slippage, which would otherwise result in heat build-up and shortened shoe life. When the clutch is not pressurized, Centrifugal force insures complete disengagement of the shoe from the drum. Since all power is transmitted through the flexible pneumatic rubber expansion tube, minor misalignment is absorbed through the clutch with no damage resulting either to the connecting machinery or the clutch. Pneu&dash;Grip clutches are dynamically balanced and receive a thorough inspection before leaving the factory. This style Pneu&dash;Grip clutch ranges in size from 6" to 32" in diameter and can transmit up to 91,100 ft-lbs. of torque. The large ventilating air passages through the aluminum clutch shoes of the Heavy Duty clutch permit cooling airflow therefore enabling Pneu&dash;Grip clutch elements to quickly conduct damaging heat away from the operating surfaces, prolonging shoe life. The shoes are extruded yielding a stronger, high quality product that is free of the defects normally associated with a casting process. Springs assure the total disengagement of shoes from drum when the clutch element is depressurized. Pneu&dash;Grip elements are provided with two widths accommodating those applications requiring a higher thermal load or a transmission of more power without the expense of a dual or a larger diameter element. This design can transmit up to 807,570 ft-lbs. of torque through its torque bars and side plates. Centrifugal force aids in the automatic and total disengagement of shoes from drum when air tube is depressurized. The large ventilating air passages through the aluminum clutch shoes permit cooling airflow sufficient even for induced draft assemblies typical of controlled-slip reversing clutches and marine braking. To grip the inner drive or brake drum, a high-friction composite lining is riveted to the aluminum shoe and as the lining wears, the Pneu&dash;Grip clutch adjusts automatically by simply inflating to a slightly smaller diameter. Pneu&dash;Grip clutches may be bolted together for reversing marine duty. 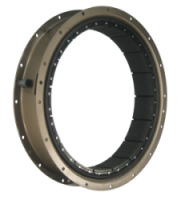 Pneu&dash;Grip Marine clutches are available up to 48" in diameter and can transmit up to 741,768 ft-lbs. of torque. Whether you're drilling inland or offshore, Pneu&dash;Grip can minimize downtime with the largest stock of OE original drawworks clutches and components as well as replacement parts for the most common drawworks manufacturers. 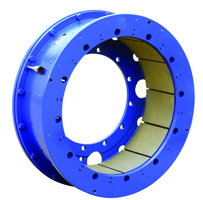 Pneu&dash;Grip Oilfield clutches are available up to 46" in diameter.